Present in a wide variety of rock types, monazite is a robust geochronometer capable of recording multiple crystallyzation events. 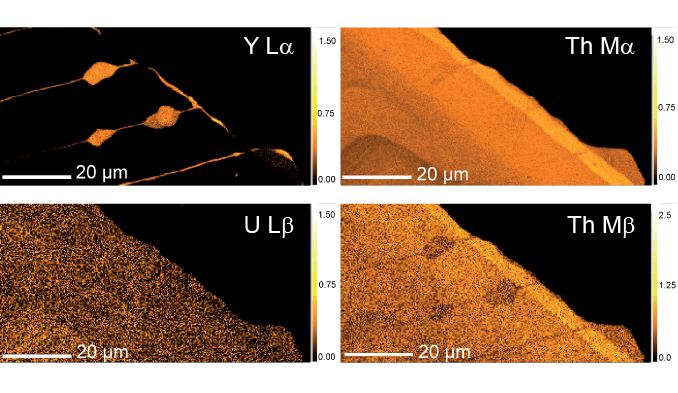 In-situ dating of monazite by measuring Y, U, Th and Pb allows the linking of microstructure and geochronology data, thus providing a new type of information for geologists. Electron Probe Microanalysis outperforms standard mass spectrometry methods by offering high spatial resolution: with spot size less than 1 µm, the lateral resolution is 10 to 100 times better than with isotopic methods. The high spectral resolution and reproducibility of the CAMECA WDS brings unmatched precision and accuracy to the trace element measurements, making the SXFive and SXFiveFE electron microprobes best suited tool for monazite dating at submicron scales. Learn more by downloading the Geochronology and EPMA application note.